From when he was toying a run for president in 1999, Trump appeared knowledgeable about the subject, urging the United States to take a harder stance to prevent the rogue regime from obtaining nuclear weapons. “North Korea is out of control. Everybody knows it, and nobody wants to say it. They’re developing weapons of every kind, of every shape and form,” Trump said in an interview with CNBC’s Geraldo Rivera in 1999. He criticized politicians in Washington, D.C. for failing to take the threat seriously. “Our weak politicians are too afraid to do anything. They come up with these phony treaties that don’t mean a damn thing and North Korea’s going to town,” he said. Back then, Trump predicted that North Korea’s nuclear program would be a major problem five years into the future, condemning President Bill Clinton’s treaty struck with the regime. Trump traveled the circuit of television news shows in Fall of 1999, speaking about the threat with NBC’s Tim Russert, Fox News Sunday’s Tony Snow, CNN’s Wolf Blitzer, and ABC’s Diane Sawyer. In each interview, he expressed his frustration with the lack of political will to react strongly to the threat. “We’re a bunch of saps. There’s no question that North Korea is developing missiles,” he told Blitzer. “You can never rule it out,” he insisted when Blitzer asked if he would consider a military response, explaining that it was essential to negotiations. “If you ruled it out, you couldn’t talk to them. Why would they? The only thing they’re afraid of is exactly what you just said … That’s what they’re concerned with,” he continued. At the time, he was keenly aware of the importance of China to negotiating with North Korea, including an understanding of trade policies as leverage. In 2013, Trump repeated his thoughts about North Korea’s relationship with China on Twitter. As a candidate for president in 2016, Trump repeatedly brought up the threat of North Korea in presidential debates. At the second Republican debate at the Ronald Reagan Presidential Library in 2015, Trump pointed to North Korea during a discussion about the Iran deal. “Nobody ever mentions North Korea, where you have this maniac sitting there and he actually has nuclear weapons and somebody better start thinking about North Korea and perhaps a couple of other places,” he said. He argued that while it was important to stop Iran from producing a nuclear weapon, it was important to focus on North Korea. Trump repeatedly pointed to the threat in North Korea on the campaign trail, focusing on the topic in January 2016 in Ottumwa, IA. Trump’s solution on the campaign trail was to get China to thwart the North Korean threat, an issue he discussed with Chinese President Xi Jingping during his April visit to Mar-a-lago in the United States. Trump continued pressing the Chinese to act, phoning the president in July to threaten trade sanctions on the country if they did not take on the North Korean threat. Despite Trump’s efforts, the Chinese have not acted significantly to stop North Korea’s bellicose rhetoric, missile tests, and ongoing efforts to produce nuclear weapons capable of striking the United States. After North Korea conducted another missile test at the end of July, Trump signaled his frustration with the diplomatic effort. Trump and his United Nations Ambassador Nikki Haley pursued sanctions from the UN Security Council. The 15-0 vote, including China and Russia, was a victory but hasn’t abated North Korea’s hostile activity. 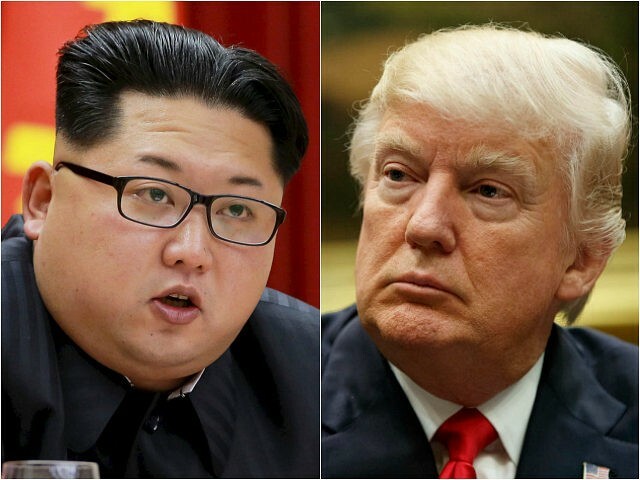 Ultimately, Trump is relying on his last option on the table — the threat of military force and “fury and fire” should North Korea continue threatening the United States. But his statement triggered alarm among critics of the president, who fretted that his aggressive language wasn’t vetted by his national security staff. “The words were his own. The tone and strength of the message were discussed beforehand,” White House Press Secretary Sarah Sanders said in a statement in response to multiple reports. An examination of Trump’s history on the subject shows he is doing exactly what he said he would do — if elected president of the United States.